Famous Smoke Shop is a leading online distributor of discounted premium cigars. The company specializes in offering the web’s widest selection of cigars at the lowest prices. Famous has just released two new cigar lines under the production and blending expertise of Jesus Fuego Cigar Company. Jesus Fuego is responsible for some of the world’s highest rated cigars, and continues to expand using the same passion for cigars that has earned him the rank of Master Blender. 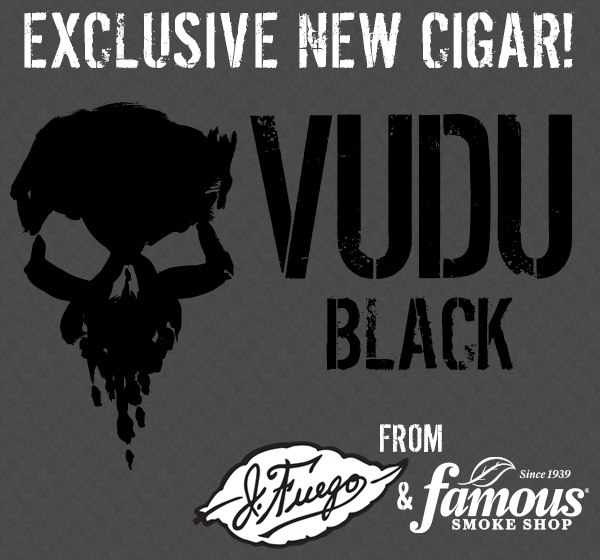 The new releases are the highly anticipated VUDU Black and VUDU Sacrifice, and these two blends are exclusively available at Famous Smoke Shop. The first shipment has just arrived at the company’s warehouse and is currently available for sale on their website. These new exclusive VUDU lines are the first two releases of five lines in this extensive brand of complex and flavorful cigars. 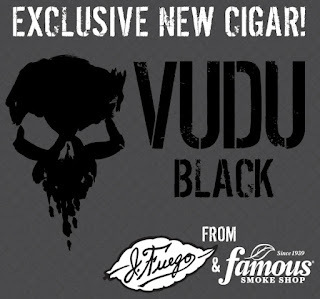 The VUDU Black’s blend is designed to provide a full bodied smoking experience, while the Sacrifice is a medium bodied smoke. Both of these cigars are designed for those who enjoy rich and flavorful cigars. VUDU Black is rolled in Nicaragua and utilizes a blend consisting of a complex mixture of potent Nicaraguan fillers and binder, all wrapped in a dark oily Pennsylvania Sun Grown wrapper. The result is a full strength cigar with complex flavors. Cigar smokers should expect a blend that has a powerful hit of rich tobacco flavors, spice, and a natural smoky sweetness that pours off the cigar for an all-around well-balanced smoke. VUDU Sacrifice utilizes a blend consisting of a complex mixture of Honduran and Nicaraguan core tobaccos, all wrapped in Jesus Fuego’s trademark Corojo wrapper; the same wrapper he’s used in some of his highest rated cigars. The result is a medium strength cigar with full bodied flavors. Cigar Smokers should expect a tantalizing mix of rich tobacco flavors, along with a pronounced medium bodied sweetness to balance the cigar to a perfect mix of strength and taste. Both the VUDU Black and Sacrifice cigars are available in innovative humidification jars with a Boveda pack to keep them humidified and are offered in four sizes – a 5 1/2 x 52 Cuban Corona, a 4 3/4 x 50 Robusto, a 5 3/4 x 50 Toro, and a 6 3/4 x 50 Churchill. The names of the sizes are the No. 13, No. 3, No. 7, and No. 9 respectively, and will all be shipped in their well-sealed, heavily decorated humidification jar for guaranteed freshness. With Famous’ everyday discount pricing, customers can enjoy this new offering with individual retail prices starting at $2.69 to $3.63 per cigar respectively. People interested in learning more about VUDU cigars or Famous Smoke Shop should visit Famous-Smoke.com or call 800-564-2486.